Monday June 12, 2017; Another perfect day with bright sunshine, very light wind and the promise of warm summer temperatures. As pre-arranged, we were underway at 0900 hours for Castine Harbour, a 13 nautical mile run. Castine Harbour is on the Bagaduce River and the moderately narrow river causes a significant 2 knot current in either direction with the tidal flow, so when grabbing a mooring ball, it requires great coordination between the Captain and the Admiral. We chose to rent a mooring from the famed Eaton’s Boatyard. 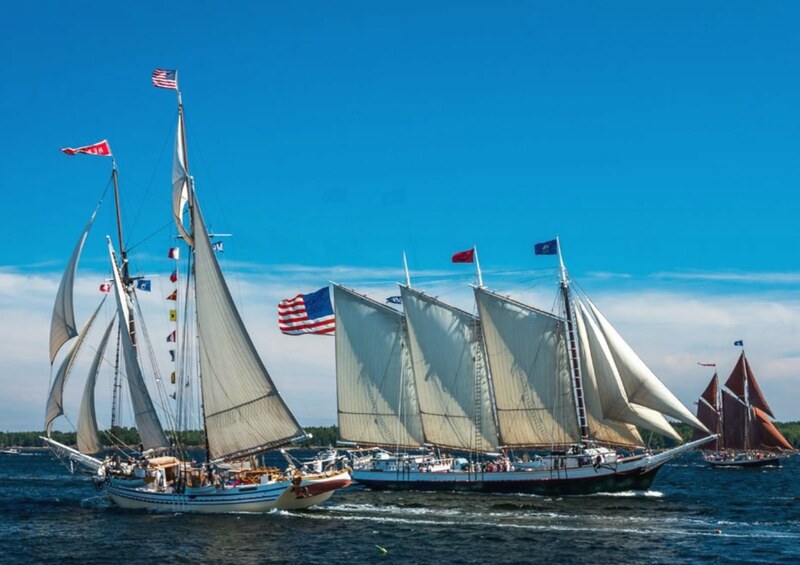 Owner Kenny Eaton has been a fixture in Castine for many decades and he distinguishes his business from others with such things as delivery of morning newspapers to a free lobster with your mooring fee in July and August (we were a little early for that benefit). A local author has written a book about Kenny and his friendly antics and his helpfulness to all. Inside his prominent and crotchety building is, what appears to a casual observer, the most disorganized collection of boating gear imaginable, both new and used. But if you ask Kenny for something, he knows what he has and where to find it. 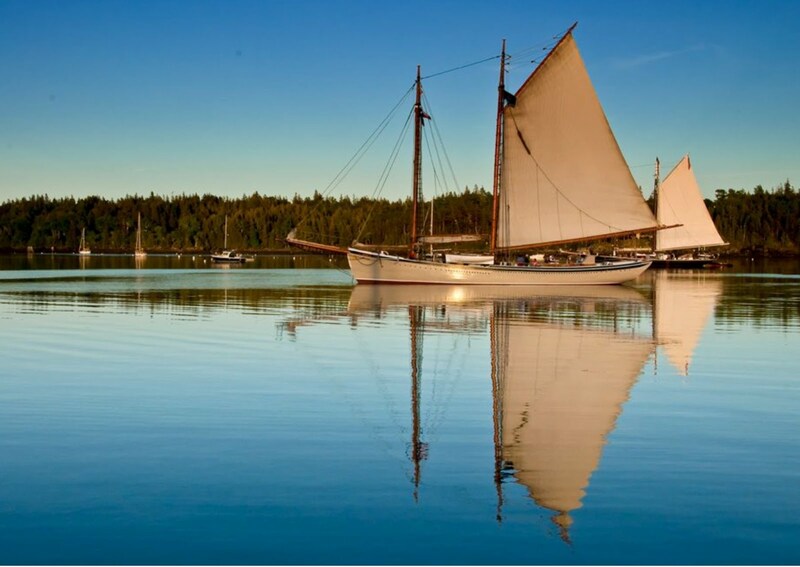 Castine is one of the oldest towns in New England, predating Plymouth be about seven years. It was originally a fur trading post. During its tumultuous history, Castine changed hands 25 times among the English, French, Dutch, Spanish and American colonists. The entire town is on the National Historic Register with many fine examples of its historic architecture. 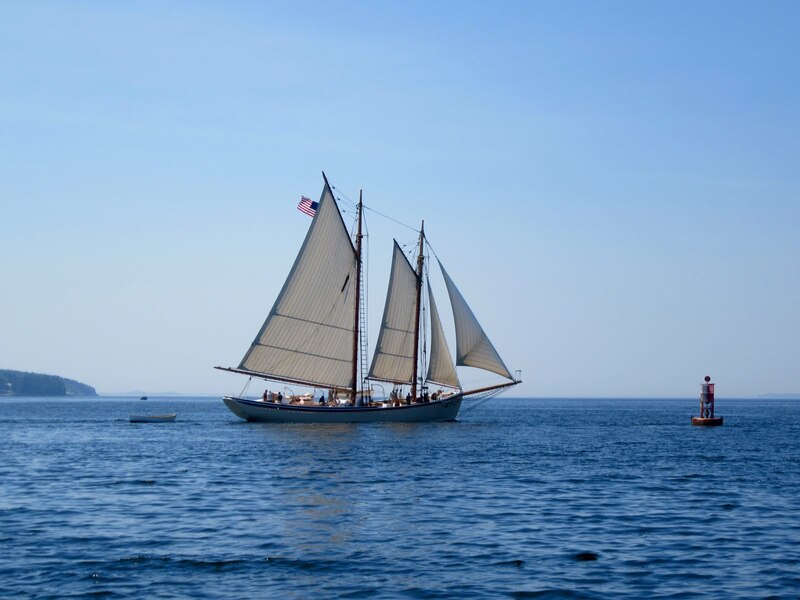 Today Castine is home to the Marine Maritime Academy, established in 1941 to train merchant seamen and now offering a range of courses in engineering, management, transportation and nautical & ocean science. This summer weather is addictive - another sunny day, bound for temperatures in the high 20’s. 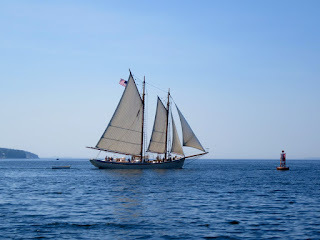 We got underway by 0830 for Camden, Maine, about 19 nautical miles away on the west shore of Penobscot Bay. Camden was first settled in 1771 by folks trying to scrape by with modest farming in the mountainous terrain. Like Castine, Camden has a storied history of conflict. In the mid 1800’s the town had sawmills, gristmills and carriage factories. There were six shipyards launching six to twelve vessels annually. Lime quarries were also a significant source of commerce. In the late 1800’s Camden’s natural beauty was discovered by sportsmen and those seeking summer and autumn homes and those nostalgic for the sea. Thus began the property buying and grand summer homes being built by the wealthy from Boston, New York and Pennsylvania. 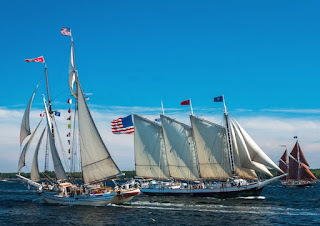 One of the most enduring symbols of Camden and Penobscot Bay are the schooners or windjammers. 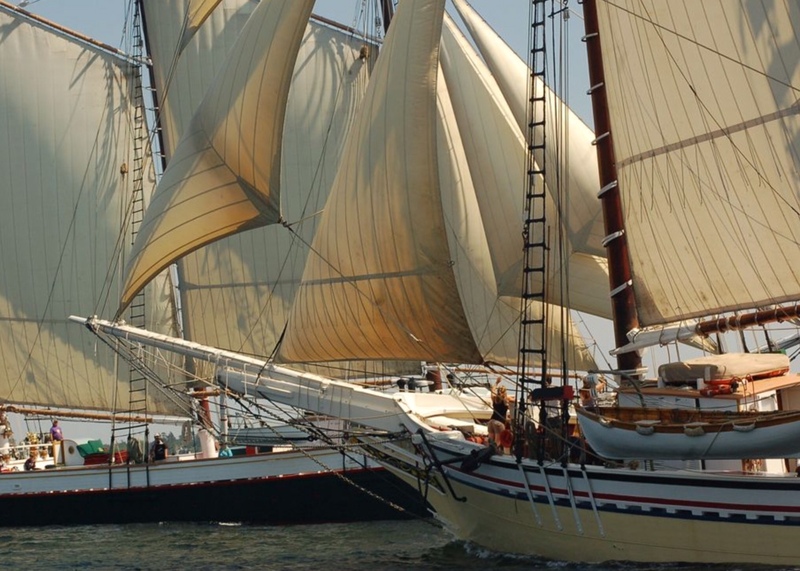 Once, thousands of wooden sailing ships raced up and down the eastern seaboard in hopes of being the first to market with their cargo. 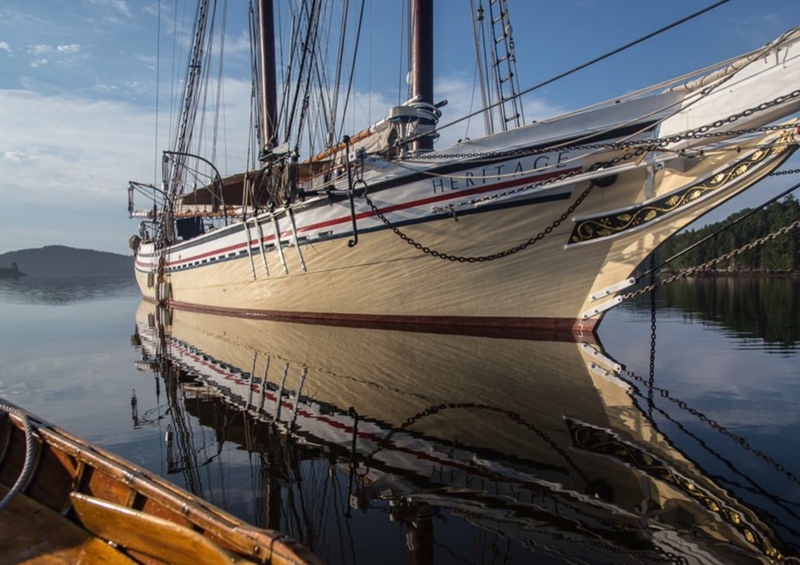 Now a days, instead of carrying fish, granite and lumber, these venerable tall ships sail the bays of Maine, transporting guests back to the golden age of sail. Most of these ships are schooners, which have at least two masts, with the shorter mast forward. They were first built in the 1700’s, designed for speed and minimal crew. 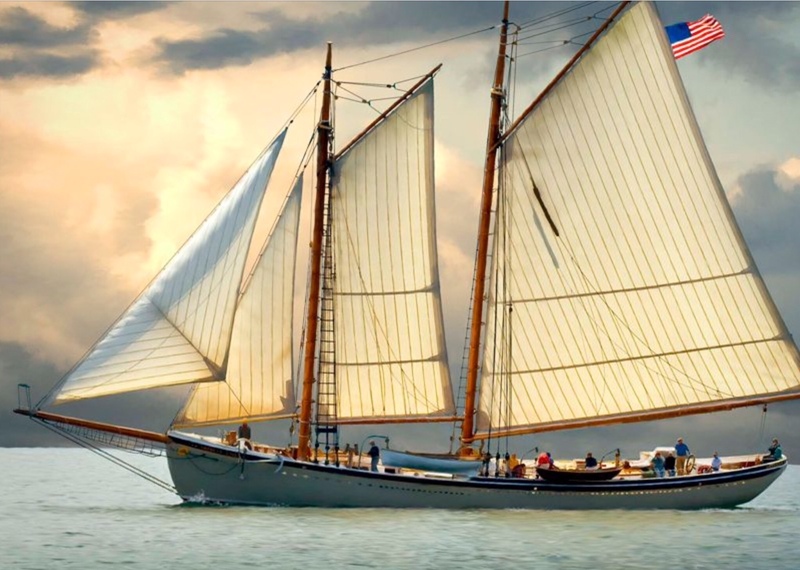 In their heyday, schooners were the workhorses of a young and thriving America carrying everything from coal and oysters to bricks and Christmas trees. By the 1930’s commercial sailing ships couldn’t compete with trains and steamships and they were on the verge of abandonment. An artist named Frank Swift from rural Maine saw the beauty of these schooners and through his paintings and finally through buying a schooner in the mid 1930’s and offering “Windjammer Cruises”, he single handedly started the revival of schooners in Maine. 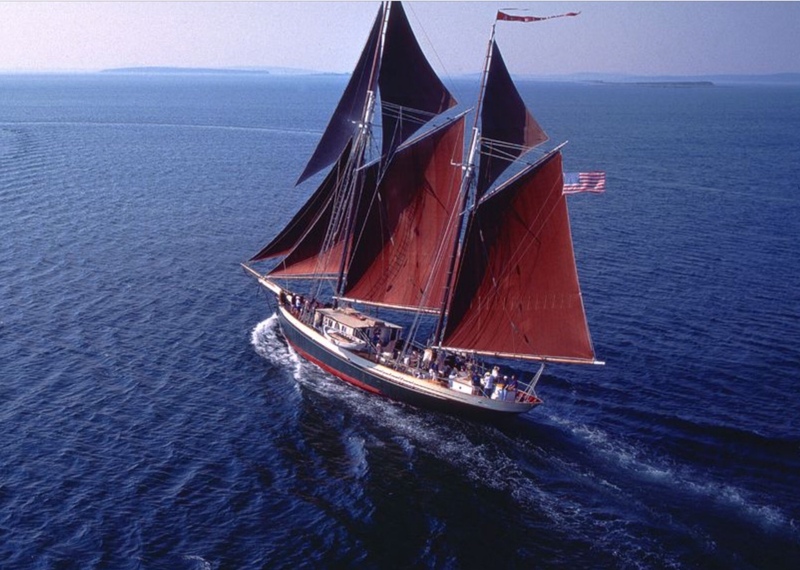 Today, there are vessels in the Maine Windjammer Association, seven of which have been designated National Historic Landmarks. Here are some pictures of this wondrous fleet. For boaters, the name Panbo and Ben Ellison may ring a bell. He is the Senior Electronics Editor for Passage Maker Magazine, Sail Magazine, Power & Motoryacht and others and he uses his boat is a lab for testing and reporting on new electronics. A friend and reader of our blog, Tim, who boats on Lake Huron and Georgian Bay was following our movements via the AIS website (https://www.marinetraffic.com/en/ais/details/ships/shipid:5038556/mmsi:316015007/imo:0/vessel:TUGN) notices we were in the same harbour as Ben Ellison’s boat Gizmo. He encouraged us to go visit Ben, which we did. I introduced myself as an avid follower of the Panbo info emails and let him know how many of our Great Lakes boating friends read his material. Ben was just finishing up an install of a Webasto Hydronic Heater, which I was very interested in and during our discussion, I was delighted to be able to solve a problem he was having with a wiring question. I also took the opportunity to discuss a problem I was having with our cell phone signal booster and Ben offered to see if he had an antenna extension and replacement cell phone cradle at home for me which will hopefully see our signal booster back in service. Camden is a very picturesque town whose population triples during the summer. Its combination of historic buildings, attractive and busy harbour, great restaurants and boutiques makes it a great stopover. 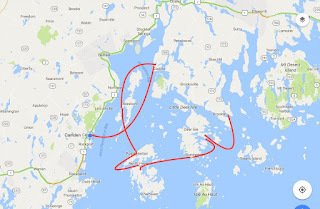 We stayed at the Camden Yacht Club on one of their inner harbour “float docks” and used their tender services to get back and forth to shore. everyone we met were so very helpful and friendly. Interestingly, an initiative by the State of Maine reimburses marina’s offering pump out services (for our black water holding tank) to help keep the ocean clean. Very impressive and how it should be. Canadian maritime provinces could learn from this example. We have seen small cruise ships in Castine and Camden. One can also see this area on one of those magnificent schooners whether its for an afternoon or w week. Interestingly, however, the summer boating season is not fully underway yet. Most mooring fields are quite empty and shops, yacht clubs and marinas say things will really begin to pick up at the end of June. I'm thinking, with this great weather and light crowds, our timing is pretty perfect. 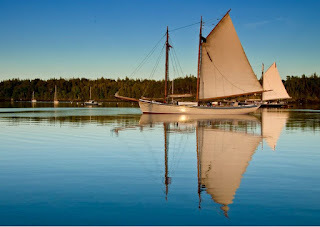 We live in Boothay Harbor, west of Camden and keep our boat in the water year round. May/June and Setember/October are often the very best times of year for cruising, so you've chosen a great time to be here.